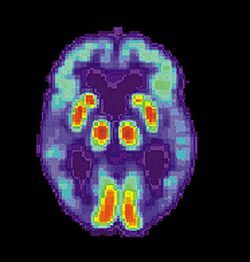 A PET scan of the brain of an individual with Alzheimer's disease reveals a loss of function in the temporal lobe. Alzheimer's disease is "characterised by loss of neurons and synapses in the cerebral cortex and certain subcortical regions. This loss results in gross atrophy of the affected regions, including degeneration in the temporal lobe and parietal lobe, and parts of the frontal cortex and cingulate gyrus. Some of the primary symptoms of Alzheimer's disease are: memory problems, mood swings, emotional outbursts, brain stem damage which impairs function in the heart, lungs plus causes disruption of various other bodily processes. Obesity/diet are linked to the development of Alzheimer's disease. “ Patients who maintain a greater sense of purpose in life as they age may have greater protection against Alzheimer's disease, researchers have found. Those with a purpose had more than a 50 percent reduced risk of the disease, Dr. Patricia A. Boyle of Rush University Medical Center in Chicago and colleagues reported in the March issue of the journal Archives of General Psychiatry. As adults, children who attended religious services regularly are 47 percent more likely to have a high sense of mission and purpose. May religions teach moderation or abstention when it comes to drinking alcohol beverages. The abstract for the 2018 journal article Transcriptome analysis of alcohol-treated microglia reveals downregulation of beta amyloid phagocytosis which was published in Journal of Neuroinflammation indicates: "Our results define alterations that occur to microglial gene expression following alcohol exposure and suggest that alcohol effects on phagocytosis could contribute to the development of Alzheimer’s disease." The cerebral cortex is the outermost layer of the vertebrate brain. These are labeled based on the cranial bones that overlay them as the: frontal lobe, parietal lobe, temporal lobe, and occipital lobe. The cerebral cortex is predominantly gray matter. “ The frontal lobes are considered our emotional control center and home to our personality. There is no other part of the brain where lesions can cause such a wide variety of symptoms (Kolb & Wishaw, 1990). The frontal lobes are involved in motor function, problem solving, spontaneity, memory, language, initiation, judgement, impulse control, and social and sexual behavior. The frontal lobes are extremely vulnerable to injury due to their location at the front of the cranium, proximity to the sphenoid wing and their large size. MRI studies have shown that the frontal area is the most common region of injury following mild to moderate traumatic brain injury (Levin et al., 1987). “ The frontal lobe is the part of the brain that controls important cognitive skills in humans, such as emotional expression, problem solving, memory, language, judgment, and sexual behavior. It is, in essence, the “control panel” of our personality and our ability to communicate. It is also responsible for primary motor function, or our ability to consciously move our muscles, and the two key areas related to speech, including Broca’s area. The frontal lobe is larger and more developed in humans than in any other organism. Atheist Greta Christina wrote: "A lot of atheists, humanists, and other nonbelievers are leery or dismissive of meditation and mindfulness." Although many atheists in the Western World are reluctant to meditate, in the East nontheist Buddhists often practice meditation. “ Spirituality and the practice of religion may help slow the progression of Alzheimer’s disease, according to research that will be presented at the American Academy of Neurology 57th Annual Meeting in Miami Beach, Fla., April 9 – 16, 2005. The study assessed 68 people aged 49 to 94 who met criteria for probable Alzheimer’s disease. Religiosity and spirituality were measured with the validated Duke University Religion Index and the Overall Self-Ranking subscale from the NIH/Fetzer Brief Multidimensional Measure of Religiousness/Spirituality. These methods collected information on the patients’ practices such as attendance at religious events and private religious activities. “We learned that the patients with higher levels of spirituality or higher levels of religiosity may have a significantly slower progression of cognitive decline,” said study author Yakir Kaufman, MD, who conducted the research as a fellow at of the Baycrest Centre for Geriatric Care in Toronto, Ontario and is now the director of neurology services at The Sarah Herzog Memorial Hospital in Jerusalem, Israel. Spirituality and private religious practices accounted for 20 percent of the total variance. Kaufman said that further studies are needed to better understand the connection between religiosity and cognitive decline. “These findings may warrant an interventional study looking at the possible effect of enhancement of spiritual well-being as a means of slowing cognitive decline,” said Kaufman. Spiritual care can reduce care strain in home caregivers of the elderly with Alzheimer's disease. Can atheists have meaning and purpose in life? What does the Bible say about the meaning/purpose of life? Under a Christian worldview: What is the purpose and meaning of life? ↑ Healthy aging and dementia: findings from the Nun Study', Snowdon DA, Annals of Internal Medicine 2003 Sep 2;139(5 Pt 2):450-4. ↑ Spirituality, religion, and Alzheimer's disease. by SG1, Whitehouse PJ., Journal of Health Care Chaplaincy, 1999;8(1-2):45-57. ↑ Effects of Spiritual Group Therapy on Caregiver Strain in Home Caregivers of the Elderly with Alzheimer's Disease by Mahdavi B1, Fallahi-Khoshknab M2, Mohammadi F1, Hosseini MA1, Haghi M1., Archives of Psychiatric Nursing, 2017 Jun;31(3):269-273. doi: 10.1016/j.apnu.2016.12.003. Epub 2016 Dec 7.